This is the week to qualify for statewide elections, and for county commission: from 9AM Monday March 5 through noon Friday March 9, 2018. This is also the year for the Lowndes County School Board. We need candidates to run for those local offices. We need candidates to run for Georgia House 174-177, and for Georgia Senate District 8. There are Democrats running for statewide offices. in a while, so it’s time to call for one. This entry was posted in Candidates, Elections and tagged 2018-03-05, Candidates, Chair, Elections, Fred Swann, Georgia, Gretchen Quarterman, J.D. 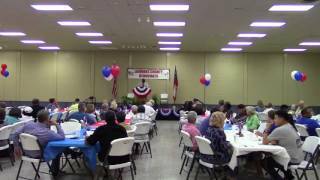 Rice, Jim Parker, LCDP, Lisa Ring, Lowndes County, Lowndes County Democratic Party, phonebank, Valdosta on March 4, 2018 by lowndesdems. Lowndes County Democratic Party meetings are always informative and even inspiring. In May, we had Corey Hull, of the Valdosta-Lowndes Metroplitan Planning Organization (VLMPO), who updated us on public transportation. At our July Annual BBQ we were joined by a number of local Democratic candidates who shared with us why they were running for office. We were also joined by Sarah Todd, Democratic Party of Georgia Vice Chair for County Parties, and Claudia Collier, Democratic Party of Georgia Greening Chair. You’ve already seen a few pictures from the BBQ. Here are videos from that fine day, July 6, 2017. This entry was posted in Candidates, Elections and tagged barbecue, Candidates, Chair, Chairman, Claudia Collier, Demarcus Marshall, Dexter Sharper, elected officials, Elections, Eric Howard, Fred Swann, Georgia, Georgia House of Representatives, Greening Georgia, Gretchen Quarterman, J.D. Rice, Jim Parker, LCDP, Lowndes County, Lowndes County Commission, Lowndes County Democratic Party, Meeting, PR, Richard Saeger, Sandra tooley, Sarah Todd, Teresa Moffit, U.S. Congress, Valdosta, Valdosta City Council, Valdosta State University, video camera, Vivian Miller-Cody, VSU on September 27, 2017 by Jim Parker.